Before engaging staff in the field, an appropriate inventory planning step will save time and cost of the resulting forest inventory, as well improve sample accuracy and precision. An element often missed when conduction forest inventories are dealing with forest edges. These have to be sampled correctly to prevent a biased inventory. Edge plots (also known as mirage plots) are applied when part of the standard plot falls outside the forest boundary – typical net stocked area (NSA) of the forest inventory. Edge trees are often known for being shorter and larger trees with larger branching and increased damage from environmental factors. Basal area and stocking may be affected by the length of the drip-line related to NSA mapping. There are several methods to sample edge plots; no method is more right than other, what is paramount is the measuring of edges. Before considering the establishment of edge plots the boundary definition has to be in place. It is imperative that the field crew clearly understand the inventory population boundary on the map and can identify this in the field. These are marked on all maps, mostly as a colour / shading change or a bold line. The inventory population may include tracks, roads, un-stocked areas and stocked skids, where these fall within the mapped population boundaries. All plots with centres located in the inventory population are to be established, measured, and recorded. There are three types of boundaries you may encounter. To enable accurate data collection, boundaries have to be clearly defined. 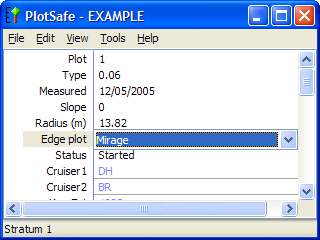 This ensures that all of the crews will use the same methods for locating mirage plots. If the boundary is not clear to the crew then the plot will be moved into the inventory population one plot radius and a full plot will be established. Please mark assumptions made on the inventory map and comment in the plot header. Note that doing this when the boundary is clearly definable is a serious bias. Below is a guide to the procedures in establishing and recording edge plots. First locate the original plot centre as normal. When using a GPS beware the error of the GPS can sometimes be greater than the edge you are locating yourself within. Therefore it is often practical to measure from the map the distance from the forest edge (e.g. 5m). Then locate the forest edge as defined by the boundary definition and then measure this distance back into the stand. Measure the distance between the original plot centre and the stand boundary. This becomes distance A as shown in figure 1. (Note it is imperative that the field crew clearly understand the inventory population boundary on the map and this can identify this in the field). Place another plot centre the same distance outside of the population boundary (i.e. in the opposite direction to the original plot centre). 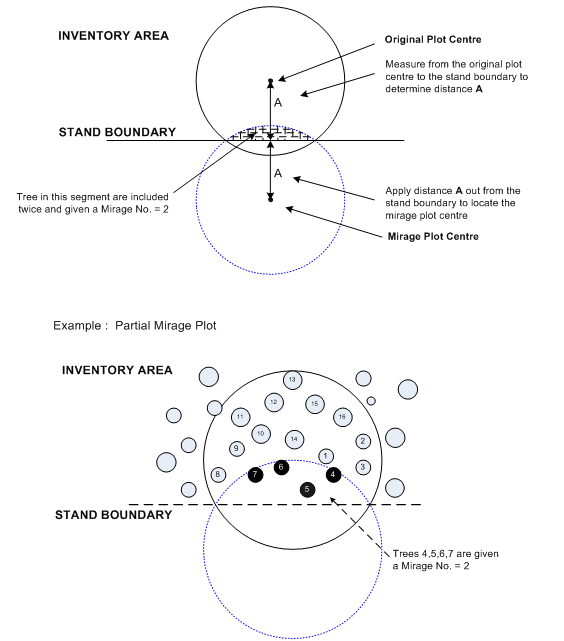 At this point locate and mark the mirage plot centre and establish the mirage plot around this plot centre using the same plot size as the original plot. The slope in mirage plots will be taken from the boundary looking into the stand on the steepest slope to a point at the far edge of the plot. A second angle opposite this will not be taken. 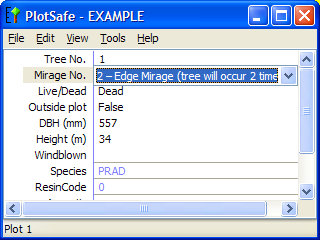 Any trees which are common to both plots (inside the overlap with the mirage plot) are recorded with a Mirage No Code of 2 in the tree level. Trees inside the original plot but outside the overlap with the mirage plot should be given Mirage No Code of 1. Note that the default marginal code of a tree is 1. If the original plot centre lands right on the population boundary (i.e. the distance from the boundary = 0m) then it is a Full Mirage Plot. Only one centre needs to be established and all trees should have a Mirage No. of 2. This is an advanced mirage method which allows the user to sample none straight boundaries or fragmented forests. The methodology is available here in detail. If you have further questions to above, please contact us.